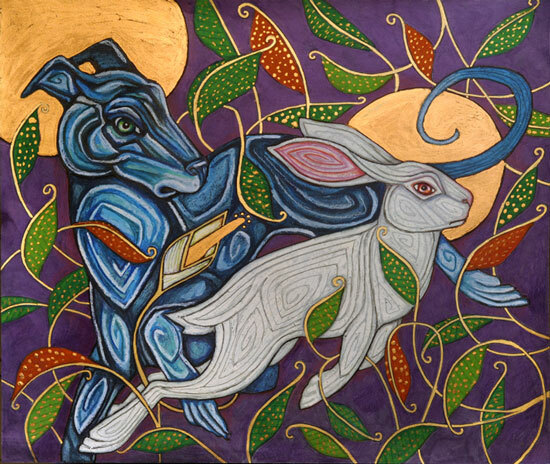 Mixed media on paper, 19"x 25"
This artwork is inspired by the old Irish tale of the daughter of the High King. She was a beautiful woman but of free spirit and no man could court her. Her father the King decided that at the next Beltaine, that the first man who could catch her (as she was well-known for being an excellent runner) would be her husband. The daughter went to a wise woman and asked for a potion to make her as fleet as a hare. However, the wise woman was either getting deaf in the ear, or was a trickster, for when the girl drank the potion before the race, she turned into a hare. She was then chased by her father's greyhounds, and being terrified, she ran into the woods, where she was caught in a trap. A huntsman came to check his snares and instead of a meal, he found the princess. The King was true his word, and he married them; the huntsman being handsome, the princess found that being married to him was not so bad a thing. In this version I am trying to emphasize the sexual undertones to the original story, with the lily appearing to both symbolize innocence and chastity as per tradition, however, in other cultures the lily represents sexuality. I took some liberties with the lily and made it a kind of stylized hybrid between a lily and an anthurium, which has a very interesting shape! The vines in this image are also symbolic to the Celts and is a theme used in their artworks. The meaning is connection and eternity. Vines also often grow in a shape of a spiral, which, to the Celt represents growth, renewal, energy, life etc.